When I was young, I lived in the Northern Sacramento Valley, near the Sacramento River. When the Sacramento River flooded the entire area; the Coast guard sent H-52 helicopters to rescue people. That greatly impressed me. My Grandfather served as an electricians mate in the Navy in WW I. Two of my uncles served in WW II; and one was a Navy fighter pilot. He was my Hero. I anted to b a Navy fighter pilot too. But at 6′ 3″, I was told I was too tall to be a fighter pilot. My father served in the Army in Korea, in a special unit, that required him to work with all other branches of military, including NATO forces. Of all of the military units he served with; he held the US Coast Guard in the highest regard. I rejected multiple offers of an appointment to West Point; as I did not want to be an infantry officer in Vietnam.I applied, and made the list of approximately 10,000 qualified candidate, for the Coast Guard Academy; but my SAT scores were not in the top 300; so I was not selected. I wanted a technical education, as I enjoyed studying electricity in 4H and physics. None of the scholarships I was offered were for engineering schools. So I chose to join the Coast Guard, with a guaranteed ET school. I was the only Radar ET. It was very challenging; and I love a challenge. In the Coast Guard, As a Radar Technician, I learned very marketable skills. Throughout my four years on active duty, with the exception of in Alaska and the Aleutians, civilians, including those we rescued, treated us very disrespectfully. On my last rescue mission, the Captain of the commercial fishing vessel, after we suppressed the fire, and towed him to the station and inspected his vessel, spat on us and called us baby killers. I was angry, and decided not to risk my life again, for people that despised me. While still on active duty, I was offered many jobs; including an offer from Raytheon; after I installed the first SPS-67V, and figured out how to make it operate correctly. However, I chose to work for the Federal Aviation Administration, as a Radar and Automation Specialist. I loved working on Radars and Mainframe ATC Computers. It was the Coast Guard that provided me the opportunity, training and experience, that paved the way for my job in the FAA. I considered Coast Guard Reserves, and was offered OCS. However, the FAA would not allow me to be a reservist, as my job was critical. While I was on the RUSH, we performed Fisheries Law Enforcement, Multiple SAR missions, Fire Fighting and enforced Maritime Salvage Law. When a Soviet Fishing Trawler ran aground while illegally fishing, and refused to allow an American tug or the Coast Guard to salvage the vessel, the RUSH was called upon for a show of force. On one ALPAT, the Soviets had a submarine dog us, in an attempt to prevent us from catching the Soviet Fishing Fleet illegally fishing. Multiple times, we detected the sub, went to condition AS1, and engaged the sub, driving it off. When we engaged one Soviet fishing fleet, we observed one trawler that was not fishing, and had an unusually high number of antennas. Captain Gannaway decided to board that trawler. Each time we attempted to maneuver alongside it, the Soviets would react by having one or more trawlers change course, requiring us to change course, to yield the right of way. 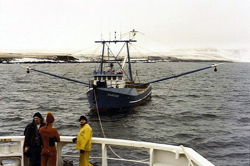 Several times, one of the trawlers even cut loose it’s net, to allow it to maneuver. The Soviets were determined that we would not board that trawler that appeared to be gathering electronic intelligence. After many hours of playing the Soviets cat and mouse game, Captain Gannaway ordered the the RUSH to GQ, fired up the turbines and at high speed maneuvered the ship into position to board the suspicious trawler. The Soviets weren’t happy with us and even threatened the boarding team. A 1911 aimed at the face of the belligerent Russian calmed him down. A memorable mission was when we received orders to aid the Storis in fighting a fire in an Aleut village. We made turns to arrive on scene as soon as possible. It was dark when we arrived on scene, and the Storis was already there. The bay was full of debris, and the dock was ablaze. We launched both 25′ mlb’s, equipped with pumps, to suppress the fire on the dock, and to clear a path for the ship to dock. 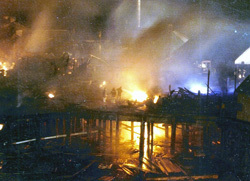 The 25’s were supplying water to the underside of the dock, as the ship suppressed the fires on top of the dock. Once we were in position to tie up to the dock, Damage Control Teams deployed to fight the fires. The fires had already destroyed a power-plant a cannery and multiple warehouses; and were threatening the only remaining power-plant. It was winter, and bitterly cold, so loss of the power-plant would be life threatening to the residents. Eventually, most of the RUSH’s crew were involved in putting out, and keeping out the fires. We fought all night, and saved the village. We and the Storis saved many lives together. The residents were very grateful. While I was on the RUSH, we also rescued two US fishing vessels in distress, one Japanese long-liner and one ditched aircraft. I saw some big waves, high winds and sub zero temperatures. I also saw amazing wildlife. In one very bad storm, with 60′ waves, 90 10 120 knot winds, and -50 degree temp; we rescued the Sea Hawk. We lost most of our antennas in that storm. I was aloft, rigging a replacement long-wire antenna, when the top-rail of the forward port yardarm broke at one end, with me attached. That scared the crap out of me. The event later gave me material for an “A” on an English paper in college. 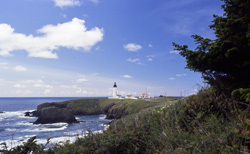 My fondest memories from my time in the Coast Guard, were from the Rush, and at Station Depot Bay; when serving as the ET for Station Yaquina Bay, Yaquina Head Lighthouse and Station Depot Bay. There are two high points in my memories on the Rush. The first was when Captain Gannaway invited me to dine with him, and discuss what I needed to get the SPS-67V working correctly. He had me sit in the XO’s chair, and the XO was seated next to me, on the other side. I was an ET3. I don’t think the XO liked that. The second was when my Chief, SCPO House made breakfast to order for me in the Chief’s Mess. Wow! 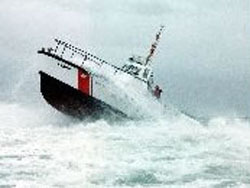 The least favorite experience was when they needed a crewman for a 44 MLB, in Yaquina Bay, to rescue a commercial fishing boat that was on fire and sinking. I was thrilled to be directly involved with a successful rescue. That is, until after we tied the boat up at the pier, and were performing a safety inspection. The skipper spit on me and called me a “Baby killer”. I rescued the beer, when fighting an industrial fire on one of the Aleutian Islands. Both the Rush and the Storris took part in the firefighting. It’s a long story. The CO of the RUSH, Captain Ted Gannaway was a great man and a great Skipper. If you look in the dictionary for Salty Dog; you will see his photo. Saving lives was a great feeling. In Alaska, we were welcome, respected and appreciated; unlike in the lower 48. My last rescue was out of Yaquina Bay Station, Newport, Oregon. We rescued a commercial fishing vessel that was on fire. We put out the fire, pumped out the water and towed the vessel to the station. When inspecting the vessel; we discovered the only fire extinguisher was not used, as it was empty; and there were no flotation devices on the vessel. When we informed the vessel’s captain, he got outraged, started cussing at us, spitting on us and calling us “Baby killer”. I wanted to take him out; but the wise Chief Boatswain’s Mate put his hand on my chest and shook his head. I walked away. That incident made up my mind to leave my beloved Coast Guard. I didn’t want to continue to risk my life for people that seemed to hold me in contempt. Saving lives was very rewarding. I am proud of the Meritorious Unit Citation with O device, we were rewarded when I was on the RUSH. A brand new Surf Rescue Survival Suit with my name on it, was presented to me at Depot Bay Station. It was a high honor; especially considering that I was just the ET that never went on a mission with them. But they were very thankful to me; because before me, they had only handheld radios that were operational. I spent many long hours, in all weather, repairing or replacing all of the electronics on both of their 44′ MLB’s. 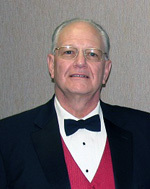 I only wore the suit once, but I was very proud and honored to wear it. Meritorious Unit Citation with O device and Brand new Surf Rescue Survival Suit with my name on it. The ribbon for lives saved under perilous conditions. The Surf Rescue Suit for appreciation and respect. 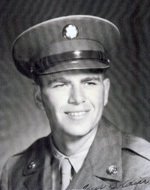 Captain Ted Gannaway. He was the pinnacle of Commanding Officers. He loved his ship, his crew, and his missions. If Webster’s was going to include Salty Dog in it’s dictionary; it would have Captain Gannaway’s photograph. Senior Chief William House was one of the finest human beings I’ve ever had the pleasure to know. He was a true Southern gentleman. He was ethical and honorable. He cared greatly for the men under his charge. I am now old and in-firmed. My memory is not as it once was. I remember all of the faces of those I served with. I even remember voices and mannerisms, but I don’t remember all of the names. I worked as a Radar, Automation and communications Specialist for 15 years. I then went into management. 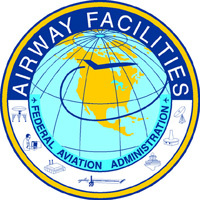 I now have multiple work related disabilities, and work part time as an Administrator and Safety Officer for the FAA. I am also the Squadron Safety Officer, and Assistant Aerospace Education Officer for the US Air Force Auxiliary, Civil Air Patrol. American Legion, Patriot Guard Riders and Yakima Warrior Association. 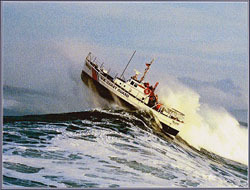 The Coast Guard started me on a challenging and rewarding career path. Because of my service in the Coast Guard, I never again thought I was working too hard or too long. In the Coast Guard, I learned the values of respect, discipline, honor, service and sacrifice. Choose a career path that teaches marketable skills. Through Together We Served I have been able to reconnect with old shipmates, No one else understands my experiences except another veteran.